1In a saucepan bring 4 cups water to a boil. Add rice and stir. Reduce heat, cover and simmer for 20 minutes. 2In a medium saucepan over medium heat, combine chicken soup and broth. Stir and simmer for 8 to 10 minutes, or until heated through. 3On 8 plates layer cooked rice, chow mein noodles, chicken soup mixture, tomatoes, celery, green pepper, green onion, pineapple, cheese and more chicken soup mixture. 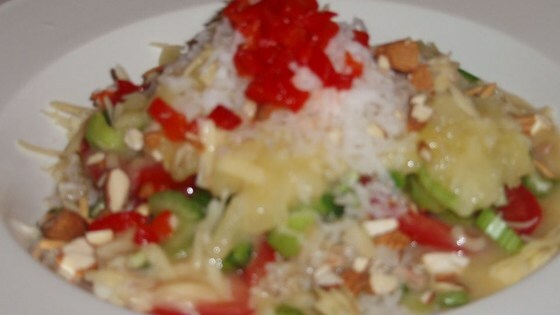 Top with almonds, coconut and pimentos.